Opening in November 2018, the adults-only Grand Bahia Principe Aquamarine will set the tone for those seeking more from their all-inclusive Caribbean vacation. The resort features 498 spacious rooms and suites, four restaurants, three bars, a spa, nightclub and endless outdoor activities. Each guestrooms is equipped with satellite TV, a minibar, and offers a balcony or terrace and 24-hour room service. Upgrade your experience to include butler service. With four restaurants, each specializing a different cuisine, guests can enjoy a new taste for every meal. 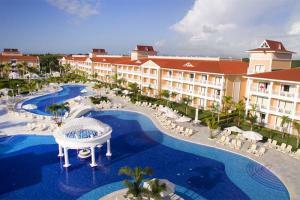 Located approximately 17 miles from Punta Cana Airport.